NORFOLK, Va. – A Valley Cottage, New York, native and 2011 Nyack High School graduate is serving in the U.S. Navy aboard USS Kearsarge. Ensign Judith Cho is a surface warfare aboard the amphibious transport dock operating out of Norfolk. Kearsarge, one of the Navy’s most advanced amphibious ships, is designed to deliver Marines and their equipment where they are needed to support a variety of missions ranging from amphibious assaults to humanitarian relief efforts. A Navy surface warfare is responsible for the internal communications. They are responsible for radios, phones and anything that is used to communicate. Sailors’ jobs are highly varied aboard USS Kearsarge. More than 1,000 men and women make up the ship’s crew, which keeps all parts of the ship running smoothly, from handling weaponry to maintaining the engines. An additional 1,200 Marines can be embarked. USS Kearsarge is capable of transporting Marines and landing them where they are needed via helicopters, vertical takeoff and landing aircraft and landing craft. These amphibious transport dock ships support amphibious assault, special operations or expeditionary warfare missions and can serve as secondary aviation platforms for amphibious ready groups. Because of their inherent capabilities, these ships have been and will continue to be called upon to support humanitarian and other contingency missions on short notice. Cho has military ties with family members who have previously served and is honored to carry on the family tradition. “My brother is also a surface warfare officer,” Cho said. 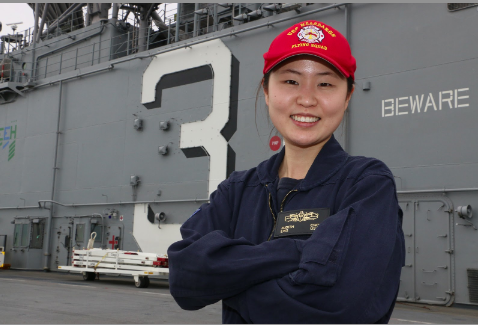 Cho’s proudest accomplishment was being qualified as surface warfare officer in an exceptionally short amount of time. Though it usually takes about a year and a half, Cho did it in less than a year. As a member of one of the U.S. Navy’s most relied-upon assets, Cho and other USS Kearsarge sailors know they are part of a legacy that will last beyond their lifetimes.